The Christmas holidays are coming, and what better way to get into the mood for the fun and festivity of Christmastime than by working on math problems with a Christmas theme! Okay… truth be told, I can think of quite a few better ways to celebrate the holidays than working on math problems. Still, if you’re going to be practicing math skills according to the Common Core State Standards Initiative, you may as well have some fun with them by injecting your math problems with a little holiday cheer! 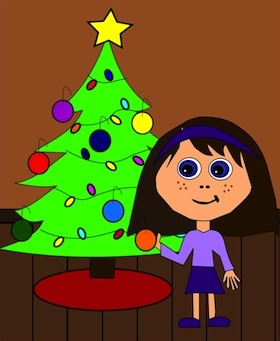 Christmas Quick Common Core Math features ten colorful worksheets in PDF format with a Christmas theme for kindergarten through to grade 5 students. These worksheets can be used on a daily basis as warm-ups to a daily classroom lesson, as in-class activities, or as homework assignments. All of the Common Core state standards for mathematics are covered for each grade level. 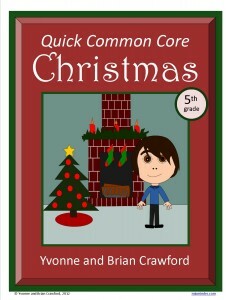 There is also a Christmas Quick Common Core Literacy, featuring the Common Core standards for English Language Arts & Literacy that I will be posting in the next couple of days. These problems have been designed to be fun to answer, featuring colorful graphics and funky fonts. If you do try them out, please let us know if your students enjoyed them! All Common Core state standards for kindergarten mathematics are covered in this packet. All Common Core state standards for first grade mathematics are covered in this packet. All Common Core state standards for second grade mathematics are covered in this packet. All Common Core state standards for third grade mathematics are covered in this packet. All Common Core state standards for fourth grade mathematics are covered in this packet. All Common Core state standards for fifth grade mathematics are covered in this packet. Have fun getting your students ready for Christmas, and the holiday season! I know I’m really looking forward to it.